US Readers do not have the widest choice of online poker games any more. Since all the major sites left after poker’s Black Friday, the only sites with enough games to support a spread of PLO and PLO8 games are Carbon Poker and Cake Poker. This article gives you a head-to-head comparison of the Omaha Poker available at each site, directly comparing them for cash games, tournaments / SNGs, software / playability, benefits such as promotions and their sign-up bonus offers. At the end of the article I’ll give my personal verdict on the best US friendly Omaha site. On the face of it the number of cash games available at Cake and Carbon Poker seem similar, with Carbon having more players. Both sites offer 2, 6 and 9 player games in all of the usual formats. PLO dominates, with PLO8 next and a smaller number of No-Limit O8. Once you start to look into the details some striking differences become apparent. First of all only Carbon has significant numbers of Full Ring (9-player) Omaha games. 6-max is popular on both sites and heads-up also seems relatively busy. The spread of buy-in levels also showed a big split, with Cake polarized at the lower middle levels (up to 50c / $1). Carbon showed the same bump in the numbers at this level, only with a lot more action both lower and higher than this – going all the way up to $3 / $6 during the day and $5 / $10 during the evening peaks. Limit games and mixed cash games are rare on either site at the moment. At the time of writing Carbon seemed to have more players seeing the flop and a somewhat bigger average pot size. I quickly compared this to Pokerstars for info, as expected these games are both looser (10% to 15% more players to each flop) and wilder (around 20% bigger pots) than at Stars. Remember this is only a snapshot taken during the day – it does somewhat confirm my feeling that the current US friendly sites have more recreational players compared with grinders though. 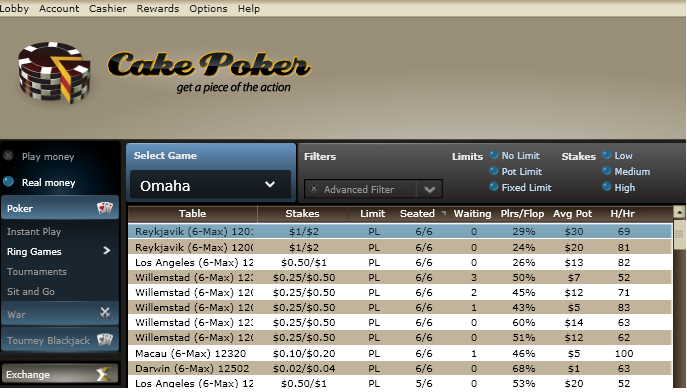 I’m giving the vote to Carbon Poker for Cash Games, they have more games to choose from and a wider spread of buy-ins. Cake are great for that narrow band of 6-max games and should not be discounted. As long as you play the $22 and below levels, then you will find tournaments in PLO and PLO8 format throughout each day on both sites. Carbon have a few more variations (with HA and HO MTTs and well as HORSE games). Balancing this Cake seem to have some decent rebuy tournaments ($10+$1) and do feature some smaller guarantees. With their larger player volume, Carbon Poker are able to offer you more games and bigger prize pools. For SNG tournaments the comparison is again reasonably close. This focuses on the $11 and under level at both sites and both include the popular double-or-nothing SNG games too. For those players who enjoy just one or two games at a time then there really is not too much between the sites in this category. You will find more choice at Carbon Poker overall. If you are the kind of player who likes to multi-table then I’m actually going to recommend joining both sites for the best or all worlds! 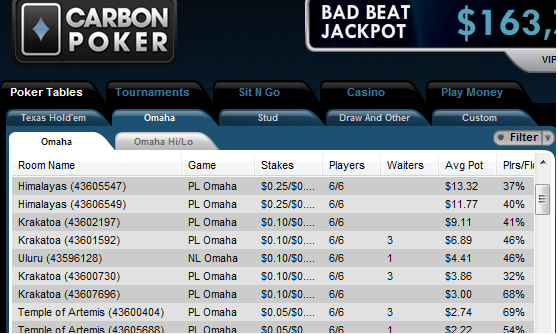 For me, Carbon Poker have an edge in the design and usability of their software. This starts with the intuitive tabbed navigation and small logos which show you each type of table in their lobby. The tables themselves look great and contain one nice unique feature – animations. These are triggered by typing in certain keywords to the chat box and can be anything from someone sweating a river card through to a headbanging panda. Even if these do not directly appeal to you, they keep the recreational players amused and make the games friendly… and we all know that a friendly poker game is a profitable one! Cake’s latest ‘2.0’ software is just fine, and they do seem to have ironed out the lags which troubled previous versions… It is just that Carbon are so far ahead in this respect that they get the top vote from me with no further arguments! Cake Poker: Their initial bonus is lower at 110% up to $600 matched to your first deposit. Where Cake stand out is with their ‘Gold Chip’ and ‘Gold Card’ loyalty schemes. Chips are awarded for volume and value of play, much like the points schemes at other sites. These can be exchanges for bonuses and tournament entries – the tournaments having surprisingly generous prize pools. Gold cards are randomly awarded during play and come in sets. You need to make different hands with your cards to claim prizes, these can be in the thousands of dollars – and you could even try for all 52 to claim $52,000. There is now a separate exchange where players can trade or sell their gold cards! Cake also have leader boards, races and a lot of one-off promotions too… a really solid performer when it comes to keeping players rewarded!! Carbon Poker: A bigger initial bonus for our readers checks in at a 200% initial match + $11 SNG token for free. After this Carbon have 2 main themes for their rewards. Firstly their VIP loyalty program is a big one, having much more than the freerolls and smaller bonuses of other sites. You can get daily cashback bonuses, buy extra bonuses and get access to exclusive tournaments and offers as you climb the levels. I have not yet directly compared, however this looks like it could be even more generous than the old Pokerstars VIP club! Carbon also have a lot of one-off promos, in fact they are running all the time! MTT and SNG leader boards, rake-races for cash game fans and a number of ‘challenge’ type events where you get bigger rewards over the course of a month are regular features on this site. Maybe I’ll call this a push! If you are a casual player then that free SNG token at Carbon is definitely worth grabbing though! Result – Carbon Win On Points! This turned out slightly closer than I thought. When I first fired up the two sites side by side Carbon looked like a clear winner. Cake have a lot of good things to offer you though… especially with the reward schemes. On balance the bigger and better game selection, fantastic software and more generous sign-up bonus make Carbon my top choice for US Omaha fans – claim your $11 SNG token and huge 200% welcome match $2000 while you check out the soft Omaha games for yourself, Click here to check out Carbon Poker for yourself now! !